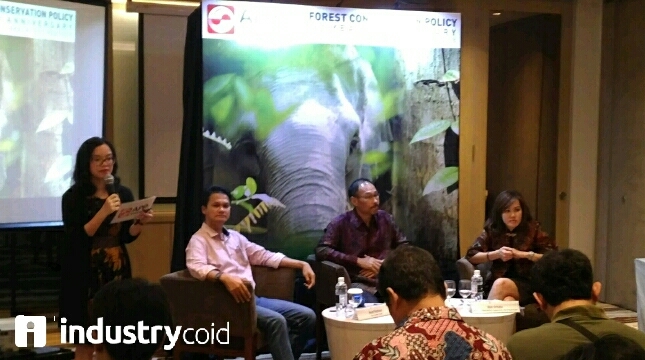 INDUSTRY.co.id - Jakarta - Asia Pulp & Paper (APP) Sinar Mas today commemorates the fifth anniversary of Forest Conservation Policy (FCP) sustainability. In a policy developed based on input from a number of NGOs and partners, APP Sinar Mas has committed itself to achieving a deforestation-free supply chain, as well as running a more sustainable business. At this meeting, APP Sinar Mas explained the progress achieved since 2013, identified the challenges, and confirmed its commitments in areas that still require further efforts. The FCP consists of four main commitments: protecting natural forests, managing peatlands better, partnering with local communities, and implementing sustainable supply chains. Since FCP was launched in February 2013, APP recorded significant progress in these four commitments, including ending natural forest conversion by timber and pulp suppliers, and switching to a 100% production process using plantation timber. Furthermore, ensuring a free supply chain of deforestation with a strong and diversified compliance system by a third party. Trim the area affected by forest fires by 2017 to 0.01% of the total gross area. In addition, it cuts the rate of natural forest loss by third parties in the APP Sinar Mas suppliers' supply area to 0.1% (Mar 2017-Jan 2018) and completes 46% of social conflicts. APP Sinar Mas has also worked with local communities to improve their quality, and empower the population to utilize sustainable modern farming techniques. As a result, incidents of deforestation, forest and land fires have decreased significantly in 2017. "Our progress is not possible without the support of our technical partners, customers, government and NGO colleagues who have given constructive criticism and encouragement for the better," said APP Managing Director Sinar Mas Goh Lin Pao in Jakarta, Wednesday (23 / 5/2018). "We recognize that we still have a lot of homework, for example in terms of land disputes, illegal forest encroachment and rural poverty issues," he added. Within five years of implementing FCP, APP Sinar Mas has invested approximately US $ 300 million to run forest monitoring systems, landscape restoration, fire prevention, peatland research and community empowerment. The Company also invests in identifying High Conservation Value (HCV) and High Carbon Stock (HCS) areas and preparing peatlands in detail, both within and around its supplier areas. Responding to the progress of FCP, Sinar Mas's Director of Sustainability and Stakeholder Engagement, Elin Sritaba said that by working with partners such as The Forest Trust and Deltares, APP Sinar Mas has succeeded in increasing protected areas to more than 20% of the supplier concession area and protecting more than 600,000 hectares of valuable natural forest. "We can also identify and deactivate 7,000 hectares of peatland plantations to initiate better forest and peatland protection," he said. Forest Conservation Policy, he continued, is a big effort taken but, he claims, has made progress. "Along with our success in achieving a target that we have identified in the FCP, we have also started to look further ahead, and we look forward to announcing a new set of sustainability targets in our 2030 vision roadmap," he added.